Habit: Herbage glabrous or slightly hairy to tomentose. Leaf: 0.2--2 cm. Inflorescence: phyllaries sparsely hairy. Flower: 12--30; style branch appendage 0.3--1.3 mm. 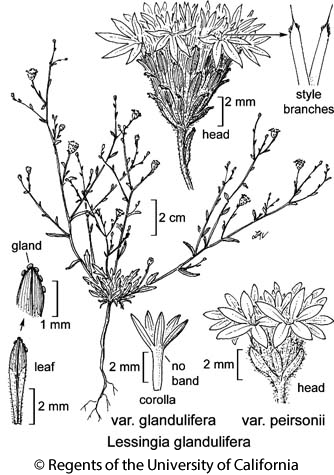 Ecology: Chaparral, pine forest, desert, generally sandy soil; Elevation: 50--2200 m. Bioregional Distribution: s SNH, s SnJV, SnFrB, SW, SNE, w DMoj; Distribution Outside California: western Nevada, northwestern Arizona, northern Baja California. Flowering Time: May--Oct Note: Some plants included here, which form tumbleweeds and have puberulent phyllaries and overlapping cauline leaves that clasp bases of involucre, are sometimes segregated as Lessingia lemmonii var. ramulosissima. Citation for this treatment: Staci Markos 2012, Lessingia glandulifera var. glandulifera, in Jepson Flora Project (eds.) Jepson eFlora, http://ucjeps.berkeley.edu/eflora/eflora_display.php?tid=7792, accessed on April 19, 2019.
s SNH, s SnJV, SnFrB, SW, SNE, w DMoj; Markers link to CCH specimen records. Yellow markers indicate records that may provide evidence for eFlora range revision or may have georeferencing or identification issues. Purple markers indicate specimens collected from a garden, greenhouse, or other non-wild location.